The Uncorked Cellar is the most comprehensive wine cellar software, inventory database and wine information source of its type available for wine enthusiasts. You can instantly access wine information, wine ageing potential and tasting notes provided by the winemaker using this easy-to-use wine management program. Manage the contents of your wine collection or home cellar. Know when your wines will be their very best, Add or select wines from your home wine cellar, recall wine ratings, track the location of your wines in the virtual rack display with this inventory software program. View a range of graphs and reports of your wine collection. Compare your tasting experiences with winemakers notes and record wine reviews. The Uncorked Cellar is your complete Wine Cellar Inventory Management solution and includes information on over 950,000 wines. Bottle tags combined with an inventory software program are an excellent tool for cellar management. 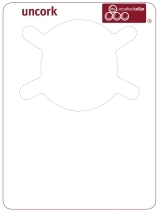 Create your own layout for these inkjet printable wine tags, or hand write brief notes on the tag. Print a bar code on each tag using The Uncorked Cellar wine software so that you can use a barcode scanner to identify each individual bottle. No other home wine cellar inventory software offers the flexibility and ease with as many UPC codes in our wine database. "How do I know my wine cellar is at a stable temperature in my home cellar ?" A thermometer which remembers the highest and lowest temperature of your home wine cellar is a must. These hygro-thermometers measure humidity as well! "Wine Enthusiast Gifts" - Wine Cellar Software with Wine Tasting Notes, Bottle Tags to track wine in the cellar, Wine Cellar Thermometer, Vaccuum Wine Stoppers keep your wine fresh, and Party People Wine Glass Markers to identify your glass at parties.